Remember the days when Dolby Surround Sound was the apex of audio? It seems in the last four years, with the onslaught of docking stations and receivers, it has lost much of its market traction. 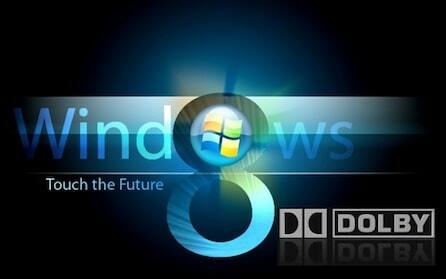 It might be time for a resurgence with its technology being used with Windows 8 tablet devices . No doubt the presence of Dolby Digital Plus’ audio technology will only go on to enhance the appeal of tablets running Windows 8, while also enabling the latter to play Dolby encoded files. The development is part of a deal between Microsoft and Dolby that will ensure clearer sound output from tablet devices running Windows 8. “This is a significant step towards delivering a premium audio experience to online content and portable devices,” said Kevin Yeaman, Dolby’s president and chief executive, during the call. Not only tablet devices will come packed with Dolby Digital Plus 5.1-channel decoding and two-channel encoding technology, but also desktops and laptops running Windows 8. Similarly, the Dolby technology will also be equally applicable to Windows 8, Windows 8 Pro, and Windows RT editions, while the same also applies to both x86 and ARM-based Windows 8 tablet devices. I would rather beats audio with the better music enhancement but i like Dolby too. For me and others I say please bring out the beats in everyone! !